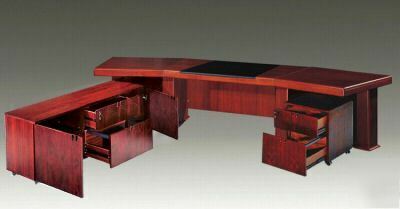 Description: Our elite class pentagon shaped executive desk. With left or right return mobile lateral file cabinet. Convenient removable duel hole ports to run cables/wires through for pc monitor/laptop cords, etc. 453.95 lbs. Locks and keys. Please see pics. 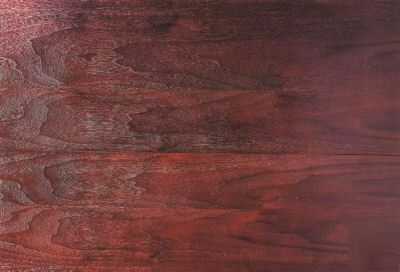 Walnut Veneer. 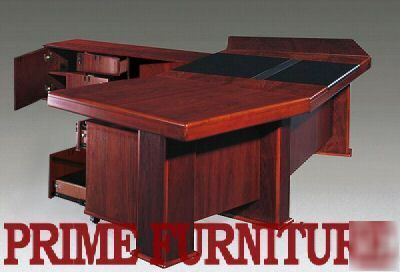 Also Avail in 8 FT Cherry Veneer and also Larger 9FT Walnut Veneer model. Please check our other listings. 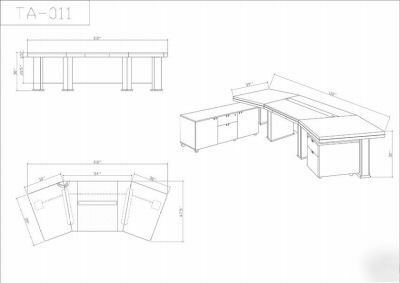 Dimensions: 8' 1 " in length of main desk 3' 3" width 2' 5" height. Mobile Left or Right return lateral file cabinet 5' 11" in length. Please see blueprint pic for precise dimensions. Please note this is the blueprint based on our 9FT version. All specs are accurate except this Cherry model is 8.1 feet in length due to popular request.